Has anyone done a study about the benefits of having an article in the local newspaper re. a church event or program. 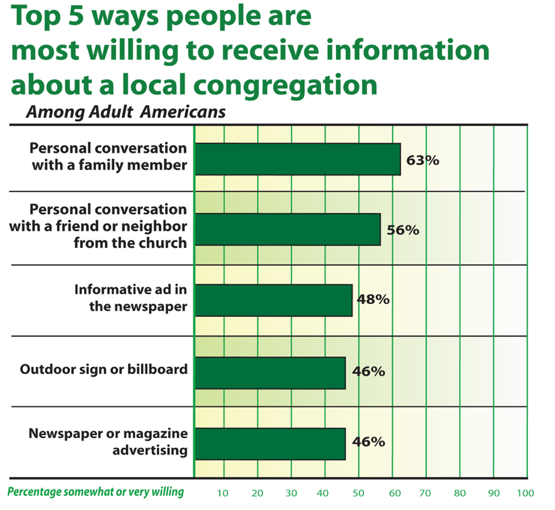 The article above lists 5 ways people are willing to receive information about a local congregation. I would like to have seen the 6th way of receiving information – an article (and a picture) of an event taking place, or the church involved in a community service event. When I’m new in a community I am drawn to the churches that are visible and actively involved in ministering to the community. I have not come across such a study. However, I have interviewed a pastor who does press releases on a regular basis. I recorded a podcast with him about how to do press releases.